I don’t believe in buying luxury cleansers. The key reason why we use cleansers is to get rid of the dirty stuff on our skin and to keep it moisturized. So after you wash your face with a new cleanser, take a close look at the mirror to see if your skin looks clean, refreshed, moist, and smooth. Listen to what your skin tells you! Also, you should buy the right cleansers for your skin type and purposes. For me, dullness and pores are my main concerns, so I choose cleansers with brightening effects that also help keep my pores clean and unclogged. 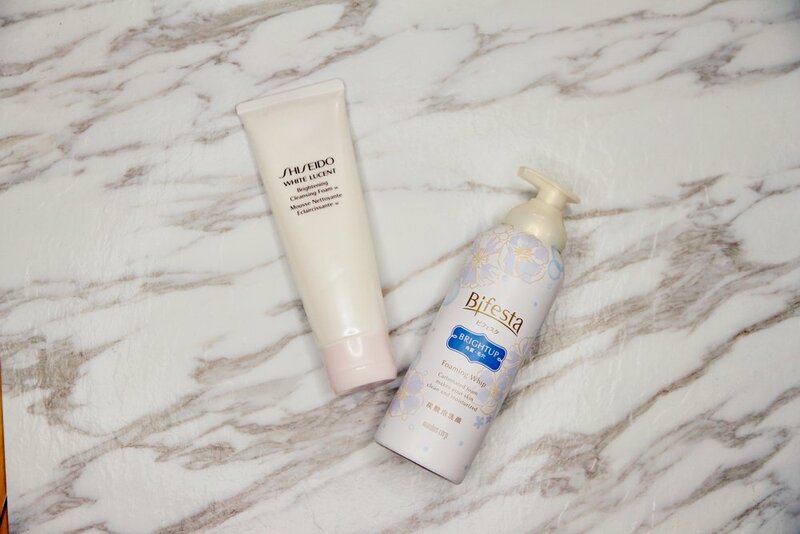 The two products I have in rotation right now is the Shiseido White Lucent Brightening Cleansing Foam and the Bifesta Carbonated Facial Foam (Bright-up version). The Shiseido one has soft, liquid foam that you lather up with water. The Bifesta one gives you bouncy foams that don’t require lathering. I use the Foreo Luna Mini to help to make the cleansing process better. It’s like doing Spa on my face every day! The fuschia color looks great on my bathroom counter, and the size is travel-friendly. I was actually quite late to the exfoliation game. The thought of rubbing rough particles on my skin makes me avoid exfoliation until my next facial appointment. But ever since I’ve upped my skincare game and picked up the right exfoliators, I’ve noticed the reduction of whiteheads and built up pores. My favorite in this category is the Innisfree Jeju Volcanic Pore Scrub Foam, a product I picked up during my last trip to Korea. Toner should always be your next step after cleansing. It helps to balance the pH level of your skin so it’s ready to absorb the products you’ll be putting on. My two favorite toners both happen to be in mist form and smell like roses! The Fresh Rose Floral Toner is soothing and moisturizing. I like it use it throughout the day to make sure my face is always hydrated! The Jurlique Rosewater Balancing Mist smells even rosier than the Fresh version; I find that my entire bathroom smells like the spa after I use it! Whereas most brands keep the toners pretty basic, I feel like moisturizer is a totally different game. Luxury and affordable brands alike both come up with all sorts of different moisturizers, claimed to have a variety of effects. For me, I like to stick to the core, which means I find the moisturizers that are the most hydrating and that leaves my skin in the best state for a long time. Moreover, they have to non-sticky and quickly absorbed by my skin so that I can layer on foundation right after. The Clinique Dramatically Different Moisturizing Lotion is one I’ve been using since high school. I love how it’s completely scent free and does its job. It’s a no bs, straight-up good product that you can use for both day and night. On days that I need an extra pick-me-up, I go for the Origins Ginzing Energy-Boosting Gel Moisturizer. It instantly hydrates my skin while creating a healthy glow. Tip: Layer a face cream over the moisturizer on days when your skin is feeling extra dry! I’ll be recommending some of my favorite day and night creams in my next beauty post. Last but not least, don't forget the SPF! Sunspots and the resulting wrinkles don’t look cute on anyone. I typically go for products with SPF 25 or more. And I use them as the last step of my beauty routine during the day, before I start on makeup. My go-to sun protection products are mostly from Japan. There is a reason why Japanese girls can stay so pale even during the hot summer season! My two favorites are the Za True White Day Protector (SPF 26) and the Hada-Labo Perfect UV Gel (SPF50). On days that I know I’ll be outdoors, I go for the Hada-Labo since I feel more protected with SPF50. On days I’m mostly indoors, I use the Za one for basic protection. When it comes to picking makeup and skincare products, I would ask friends for recommendations or go on YouTube to watch my favorite beauty vloggers. I buy most products when I’m traveling, then I try them out for at least a few months before I recommend to you all! Other than the quality of the products, another criteria to consider is seasonality, as well as your skin type and age. I have combination skin, so I get oily during the summer and dry during the winter. Before 25, I only cared about makeup and did not care about skincare at all. As I am approaching 30, I am putting more emphasis on skincare. It’s important to build a good healthy foundation! Stay tuned for my next blog posts on building an ultimate skincare routine!